Crick Marina Entrance No 2 is a minor waterways place minor waterways place place on the waterways major waterways place village town city on the Grand Union Canal (Leicester Section - Old Grand Union) between Yelvertoft Wharf (Yelvertoft village half a mile northwest) (2 miles and ¾ furlongs to the northeast) and Watford Staircase (Lock No 3 to Lock No 6) (2 miles and 5½ furlongs and 1 lock to the south). 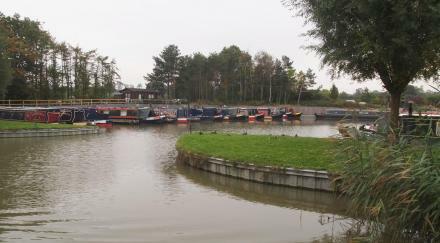 The nearest place in the direction of Yelvertoft Wharf is Crick Marina Entrance No 1; 1¼ furlongs away. The nearest place in the direction of Watford Staircase is Crick Marina Entrance No 3; ¼ furlongs away. A separate section of this big marina. West Haddon Rd, Crick, NN6 7SQ — 203 yards to the south. 17 Yelvertoft Road, Northampton, NN67 — 1499 yards to the north. 17 Yelvertoft Rd, Northampton, NN6 7XS — 1008 yards to the west. 1st Floor, 23 Church Street, Crick, Norton, NN6 7TP — 899 yards to the west. Main Road, Northampton, NN8 4 — 1012 yards to the southwest. Crick, NN6 7TF, UK — 1142 yards to the northwest. The Marsh, Crick, Northampton, NN6 7TN — 671 yards to the southwest. West Haddon Road, Crick, NN6 7SQ — 189 yards to the east. Northampton, NN6 7 — 1161 yards to the east. The Green, West Haddon, NN6 7AN — 397 yards to the southwest. Helen Reeve, Crick, NN6 7WJ — 1226 yards to the west. The Workshop, West Haddon Road, Crick, NN6 7SQ — 171 yards to the southeast. The Former Chapel, Northampton, NN67PP — 719 yards to the southwest. 12 Church Street, Northampton, NN6 7TP — 869 yards to the west. The Old Co-op, 5-7 High Street, Crick, NN6 7TR — 821 yards to the southwest. Southfield Drive, Northampton, NN67TQ — 836 yards to the southwest. 8 High Street, Northampton, NN6 7 — 837 yards to the southwest. Northampton — 878 yards to the southwest. Crick — 686 yards to the southwest. Eldon Close, Northampton, NN6 7 — 1433 yards to the west. 16 Watford Road, Crick, Northampton, NN6 7TT — 966 yards to the southwest. Northampton — 1064 yards to the southwest. West Haddon Road, Crick, NN6 7SQ — 131 yards to the southeast. southfields, Northampton — 820 yards to the southwest. Crick — 1637 yards to the northwest. West Lodge, West Haddon Road, Crick, Northampton, NN6 7SQ — 934 yards to the southeast. Bury Dyke, Crick, NN6 7XA — 678 yards to the west. A428, Northampton, NN6 7 — 110 yards to the southeast. 1 Church Street, Northampton, NN67 — 889 yards to the southwest. Northampton — 779 yards to the west. Eldon Close, Crick, NN6 7UD — 1538 yards to the west. Northampton, NN67TY — 1227 yards to the west. Rectory close, Crick, NN67SY — 1043 yards to the west. Bucknills lane, Crick, NN6 7 — 1072 yards to the west. Crick — 756 yards to the west. Crick, Northampton, NN6 7XR — 1631 yards to the west. West Haddon Road, Northampton, NN6 7UN — 1012 yards to the east. Yelvetoft Road, Northampton — 714 yards to the northwest. Crick — 604 yards to the west. 11 High Street, Northampton, NN11 3RQ — 561 yards to the west. 24 Yelvertoft Rd, Crick, Northampton, NN6 7TR — 900 yards to the west. Tolpeerth, Crick, NN6 7TP — 1064 yards to the southwest. Crick Wharf, Northampton, NN6 7XT — 201 yards to the south. Crick, NN6 7SX — 1107 yards to the west. Crick, Northampton, NN6 — 1064 yards to the southwest. Dockham Way, Northampton, NN6 7TZ — 1304 yards to the west. 205 yards to the south.